Pumpkin season is here! Pumpkins are said to have an amazing array of health benefits. The bright orange vegetable can protect against cancer, boost vision, lower blood pressure, helps you feel fuller for longer and allows you to sleep better. Pretty special for a big orange thing like this! To keep you warm during the winter months, here at Hart & Soul we have combined one of the healthiest vegetables of the season with the creaminess of coconut milk and a fusion of warm Thai spices. Whisking your imagination away to a deserted, tropical island. Absolute bliss! Sarah (@foodies_digest) understood this perfectly! The following recipe is what you make for dinner when it’s cold outside, you’re tired and short on time. So, yummy, looks fancy and reheats fantastically for lunches the next day. Taking a hot lunch, especially in cooler months, is an easy way to increase your veggie intake too. 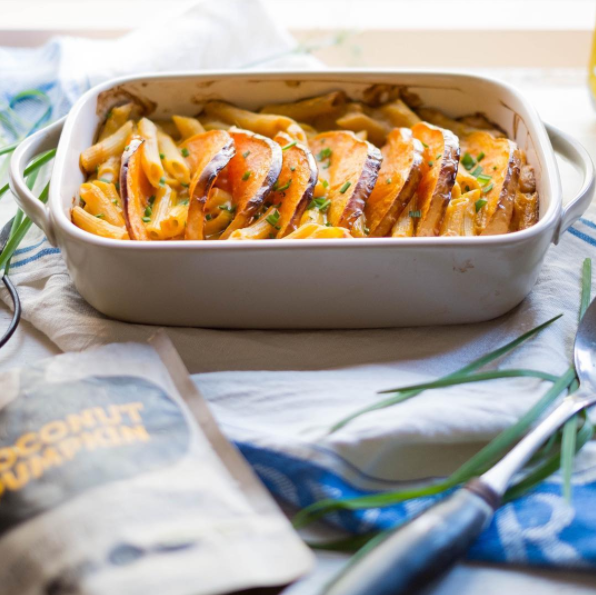 Sarah has used our new Coconut Pumpkin soup as a base to create this delicious vegan pasta bake. Very simple, very delicious and very veggieful! 500-600g of butternut pumpkin, with skin on sliced into 1cm semi circles. Bring a medium sized saucepan of water to the boil and cook the pasta according to the packet instructions. Place pumpkin slices into a baking tray lined with baking paper. Season with salt pepper and EVOO and bake for 20mins until just cooked. Mix together the contents of the Hart & Soul soup pouch with drained freshly cooked pasta and a dash of EVOO. Assemble in a baking dish with the baked slices of pumpkin, making sure that the skin side is facing up so it gets all crunchy and delicious like a hassle back potato (mmm). Bake for 15 mins, top with chives and serve whilst hot!